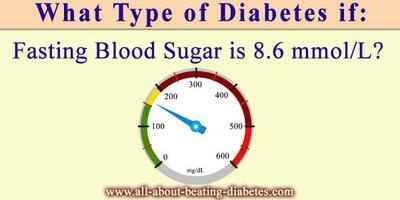 Type of Diabetes for Fasting Blood Sugar Of 8.6! QUESTION: I have no 8.6 fasting blood sugar level. What type of diabetes am I suffering? At first, I want to remind you that the normal blood glucose level is between 3.5-6.1mg/dl. However, certain deviations are observed even in patients without diabetes. I’m telling you this, because a blood glucose result of 8.6mg/dl is not that high. Moreover, there are several facts, which can explain this slight elevation in the blood glucose concentration of yours. The first is that you haven’t executed the test correctly. 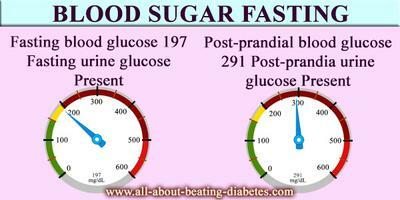 Keep in mind that when someone has an appointment for a fasting blood glucose test in the next morning, she/he has to do two things. 1) At first, you have to avoid the consumption of high-carbs meals in the evening and 2)the second is not to eat anything in the morning, before the blood glucose test. Probably you have eaten a lot the night before or eventually you have eaten or you have drunk something, which contains sugars. The second probable explanation is the restlessness caused by the fact that you are going to be tested. You have to know that when someone is under pressure, the body reacts by elevation in the blood glucose concentration. So, try to find your own way to fight with the stress. So, it would be better for you to talk to your doctor about casual blood glucose test, Oral Glucose Tolerance Test (OGTT) and A1C test. The results from those tests are going to confirm your final diagnose. In addition keep in mind that there are early symptoms of diabetes, including drinking plenty of water, frequent urination and eating a lot. Those symptoms show that there is something wrong with your body. However, they can neither confirm diabetes as diagnose. These symptoms are important because sometimes they lead the patient to go to and see a doctor. Regarding your question what kind of diabetes you might have, you have to know that there are 2 main types of diabetes mellitus. Diabetes type 1 is typical for kids and young adults and diabetes type 2 develops in patients, who are generally above the age of 20-25. The difference between those two types of diabetes is in the hormone production and in the treatment. In patients with diabetes type 1, there is not insulin secretion and they have to inject themselves with insulin. But in patients with diabetes type 2, there is reduced insulin secretion, or normal secretion of not-effective insulin. Generally, patients with diabetes type 2 are on pills for their diabetes. Remember that the exact type of diabetes is confirmed only by the tests, mentioned above. I hope that everything is ok and this elevation was a matter of stress or something else. FASTING URINE SUGER : PRESENT(+++). also tel me,which type of diet must be use 4 my dad,means which type of food take in breakfast?lunch? and dinner?n any health supplement? The high blood glucose (BG) of your dad indicate that his pancreas is not producing or secreting enough insulin, or this insulin is not functioning due to peripheral resistance. Therefore, it is important to measure the insulin levels in his urine to further understand what is happening. In case you cannot measure insulin levels in blood or urine, please advise your father to follow his doctor advice and to take the diabetic medications he/she has prescribed, never miss them. At your father age, it is important to take medications as his body cannot make it to stabilize blood sugar itself. However, your father should also follow the other lifestyle and dietary changes to succeed. I cannot specifically tell you what your father can eat at each meal, because I do not know what kind of foods are typical for Mumbai. Furthermore, everything must be calculated according to your father age, weight, height, in collaboration with your personal doctor to find out the calories he needs everyday. Breakfast: 1 slice of wholegrain bread (or rye bread). I know you eat roti, make sure your roti is made of wholegrain flour or rye flour. 1 glass or low-fat milk or 1 slice of low-fat cheese. In between meals: 1 medium size apple (preferable green) or 1 small banana (if it is medium or big, cut it in 2 parts) or 1 medium size orange or 1 small size mango; etc. The main idea is to give your father fresh fruits or vegetables, whether mixed or separate. mixed vegetables salad (e.g, mix cut tomatoes, cucumbers, onions, pepper; add iodized salt and olive oil and lemon juice or vinegar). or mixed fruits or vegetables or 5 small pieces of crackers. Dinner: 1 medium bowl of brown rice with fish fillet and a yogurt dish (e.g., cut the cucumber very firmly, add chopped garlic, mix with yogurt, salt and olive oil). Another point is that you ask your father to walk for at least 30 minutes/day, and/or to add some aerobic exercises according to his health conditions. There are some Indian herbs that help lower BG, e.g., cinnamon that I know it is wide-used in India. If you cannot find all the right herbs, you can use certain diabetic supplements that contain their extract.